Added by Indo American News on October 19, 2017. HOUSTON: Moksh Community Arts brings to you their second Annual Dance – Theater production. 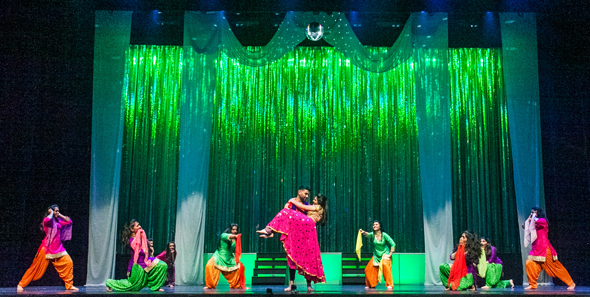 Dil Se Naach returns to Berry Center, a brand new production to premiere on October 28th 2017, showcasing innovative choreography, to Bollywood musical hits, glamorous costumes, mesmerizing Visuals with electrifying performers of all ages. Dil Se Naach 2017, titled Band Baaja Baarat performed by the Professional & Student Dance Team of NAACH HOUSTON, led by Artistic Director Mahesh Mahbubani and the Amazing Naach Faculty, Anita Vyas, Shah Ahmed, Zohair Alam, Disha Thadani, Prita Kapoor & Twinkle Khanna. This year’s showcase features 3 professional Dance Acts interspersed with 3 Student Acts concluding with the Finale which includes the whole team. Moksh Community Arts is a nonprofit with a vision to make Dance an integral part of life, for all individuals within the context of a community, inclusive of all social and cultural backgrounds. Our mission at Moksh Community arts is to create and provide performance platforms through community Dance Theater performances aimed at the physical, mental, emotional and social wellbeing of adults and children. We thank our Diamond Sponsor The Rungta Foundation, Manish & Manju Rungta for their continual support and generosity. Tickets for Dil Se Naach are selling fast at www.tututix.com; show starts promptly at 7.30 PM at Berry Center (8877 Barker Cypress Rd, Cypress, TX 77433). Houston, See you there – this is the ONE you don’t want to miss.